I adore spoiling my kids, but I know it’s no good for them, says Emily Westbrooks. I HAVE A VERY hard time resisting the urge to spoil my kids. I absolutely love the look my three-year-old daughter gets on her face when she just can’t believe we’ve given her a special new toy. I imagine most parents feel this way, especially during the holidays, when the temptation to lavish your kids with gifts they probably don’t need runs high. Of course, that’s exactly how you end up with a house full of toy clutter and kids who teeter on the edge of entitlement. 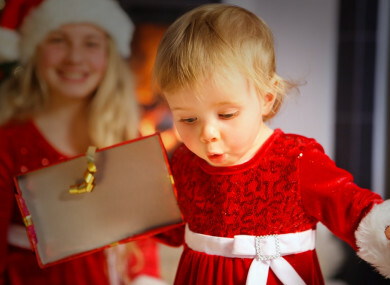 My kids may be young, but I’ve already learned that they play better with fewer toys, and keeping Christmas modest fits with our budget. I want my children to know the magic of Christmas, but with a healthy dose of gratitude for gifts they receive – and hopefully a love of giving to others. If you’re starting to build family traditions in your own home, you’ve no doubt come up against the same dilemmas I have. So what’s the best way to manage expectations? “Probably the biggest difference between my family and my peers growing up, and one I’ve continued with our kiddo, is that Santa only comes to our (modest) stockings,” says Clio, mum to a two-year-old. This means you can’t request expensive/out-of-this-world presents from Santa. Big pressies come from parents and Santa brings chocolate, socks, pants, and fun bits and pieces. We chose to give each of our kids one outfit to wear, one book to read, one thing they need and one thing to play with. This satisfies my love of gift-giving, but it also keeps me in check. Once the kids are a little older, we’ll also try to choose family adventure we can enjoy together. To keep the amount of stuff we get from other people down, we ask them to give experiences if possible. My mum got us a season ticket to Fota Wildlife last year and it was one of the best presents we got. Plus, it keeps on giving. Sydney, mom to a one-year-old son, says, “Ezra is obsessed with bagels, so he’s getting those in his stocking!” Although I’ve never wrapped a bagel, I similarly didn’t buy gifts for my kids for their first few Christmases either. Babies and even young toddlers can barely unwrap a gift and won’t remember the occasion. Grandparents and extended family will inevitably give presents, so let them take the lead for now. Jaclyn, mum to kids aged 4 and 7, tries to make it clear to her kids that the festive season is just as much about giving as it is receiving. At the beginning of December the kids each get a box to fill with toys that they are going to give away before Christmas. We then clean the toys and package them up for donation. The kids share stories/memories they have and we imagine what other children will like about the things we are giving away. Want to win a two-night stay at the 4* Galmont Hotel and Spa? Enter our competition right here - and don’t forget to subscribe to our Family Newsletter below! Email “Put Santa on a budget : 7 smart tips for avoiding Christmas overload in your house”. Feedback on “Put Santa on a budget : 7 smart tips for avoiding Christmas overload in your house”.